Three Bedroom Condominium is next to the Club house and walking distance to the River! 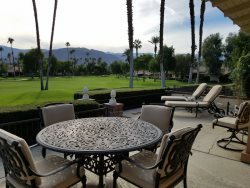 3 bedroom, 2 bath condominium in Rancho Las Palmas Country Club is beautifully decorated with style and comfort in mind. The kitchen is well equipped and perfect for preparing a holiday meal. This vacation home has two queen size beds in the master suite, two queen size beds in one guest bedroom and one queen size bed in the second guest bedroom. There is a 60' flat screen HD cable TV in the living room, and TV’s in all three of the bedrooms. The dining room provides seating for six. There is a desk in the kitchen/dinning area and a desk in the the larger guest bedroom with internet access. The extended back patio is the perfect spot for BBQs with plenty of seating providing a view of the greenbelt, pool and spa. This location is a short walk to the clubhouse, pro shops and only a 15 minute walk to The River. Take a quick walk to Starbucks in the morning, see a movie, shop or have dinner at one of the many wonderful restaurants. Wireless internet connection is offered as well as free local and long distance U.S. and Canada calling. Sorry, no pets are allowed. Owners prefer weekly rentals for the month of March. 3 Bedrooms, 2 Baths - 5 Queen Beds! This place is as advertised. It is a very nice condo, well equipped and a short walk from the tennis courts. I recommend. Wonderful family gathering place! Excellent property! Well located and well stocked. Very comfortable with plenty of room. We will definitely return! Every step of the rental was trouble free.